For a full list of new features and improvements, see the TaskMerlin release log. A new Gantt Chart pane has been added next to the Item Grid and Calendar panes. Its purpose is to provide a visual timeline for your projects and also provide an interactive way to change a task's Start and Finish dates and Duration. To view a task in the Gantt Chart, simply click on the parent folder in the Folder View pane. If the task has a Start and Finish date specified, then it will be represented as a bar on the Gantt Chart. Alternatively, if a Duration is specified (but not a Start or Finish date), then a bar will be displayed at today's date. To see all projects and tasks displayed in the Gantt Chart, click on the Desktop or Projects folder in the Folder View pane. The Start and End dates of a task can be moved by dragging the task bar to a new date location. The Duration of a task can be changed by resizing from the right-end of the task bar. The task can be edited at any time by double-clicking on the task. 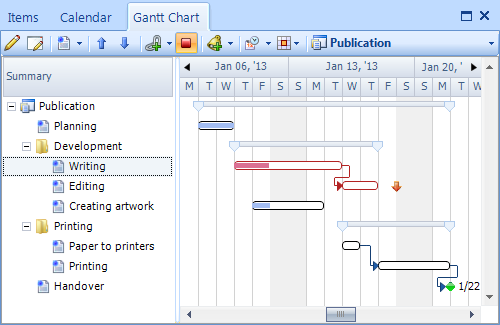 Tasks can be added to the Gantt Chart by clicking on the Create a new item toolbar button. Dependencies can be created by selecting a task as the predecessor, clicking on the Link selected item to successor toolbar button, and finally selecting the successor task. An arrow will be displayed that represents the dependency link between the two tasks. If a task is displayed, but you can't see the time period bar in the timeline, then try clicking on the task while holding down the Ctrl key. This will bring the bar into view on the timeline. Note that tasks without date or time information are displayed by default on the Gantt Chart. This makes it easy to see all the tasks associated with your projects, and also to add date or time information to them if required. However, if you wish to hide these tasks, you can click on the dropdown arrow on the Show date type toolbar button and select the Show only items with a Start, Finish or Duration dropdown menu option. As with the Item Grid pane, you can filter the tasks on the Gantt Chart via the Filters pane or the Filters toolbar button. Similarly, you can restrict the viewable period on the timeline by selecting your required date period on the Month View pane or by selecting a pre-defined period from the View time period toolbar button. Further operations, such as printing the Gantt Chart, can be found by right-clicking on the Gantt Chart and selecting from the context menu. Additional toolbar buttons are also available by clicking on the dropdown arrow at the far right of the Gantt Chart toolbar. 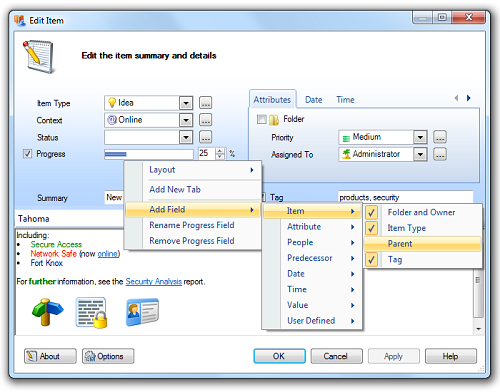 Any Edit Item window field or Item Grid column can be renamed by clicking on the Manage | Item Field Names menu option. Both existing fields and the new user-defined fields can be renamed to reflect your specific requirements. Any field or tab page can be added to or removed from the Edit Item window. You can also choose a pre-defined layout that reflects your needs by right-clicking on a field and selecting from the Layout context menu. Included are Calendar, Gantt Chart and Getting Things Done (GTD) layouts. 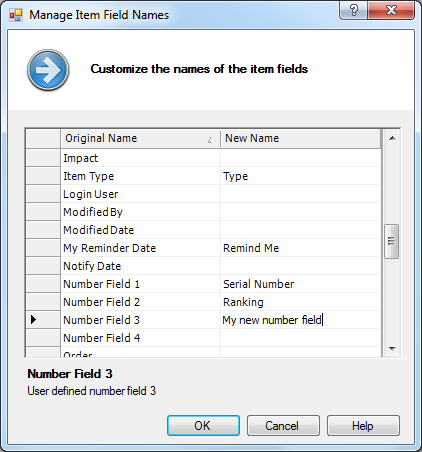 Fields can also be renamed via the context menu.